Per the recommendation of Noah’s speech and feeding therapist we have been sitting Noah in his car seat for meal time. Why? Apparently a car seat can provide an ideal sitting position for children with low muscle tone or for those that are not yet able to sit up on their own quite yet. Since you and I only have two hands, you can quickly see how this could be frustrating (or perhaps you know from personal experience) for everyone involved! In fact, when Noah was just a few weeks old he had to have a barium swallow study preformed to determine if he was aspirating. Our solution? We begin to work closely with a speech and feeding therapist who developed a therapy plan that would dramatically improve his (and mine) feeding time. Her first suggestion was to strap him into the car seat while bottle feeding. The car seat gave him the support he needed, and allowed me to focus simply on feeding him (and staring at those big beautiful eyes!) Even though I missed holding him, our feeding time together was much more enjoyable. Can you tell how much I like my upgraded feeding chair? After about five months of feeding, physical, and occupational therapy Noah begin to get much stronger and was even able to eat without having to be strapped in his car seat. In fact his speech therapist even said he was doing so well we no longer needed her services! I was overjoyed! About a month ago we started feeding Noah non-liquid food, and used the car seat for feeding since it supported his body so well. We asked our physical therapist what she thought about using a infant high chair so we could have him at the table during dinner with us. She said since he was still learning how to sit up, a highchair would cause him to work to hard, and to wait until he could sit up on his own. So we continued to work with Noah, carefully considering his needs so that we could make progress. Last week at his physical therapy appointment we were happy to learn that Noah was doing so well he was able for a feeding chair upgrade! That’s right, it was time for an upgrade (and who doesn’t like upgrades?)! The therapist thought the Safety 1st Recline and Grow Stage 5 Booster Seat was a good choice, which we purchased, and tried for the first time today. Noah seemed to do really well in it. It’s really important for a feeding chair to have multiple adjustments, and we are really happy with how adjustable this chair is. The tray is very simple to take on and off, and the seat-back reclines forward and backwards so that we can find the perfect sitting positon for our son. It also has a nice seat belt to help keep him strapped in. My only compliant so far is that the seat belt only goes around his lap. I’d like it to go over his shoulder also to help keep him from sliding down in the chair. 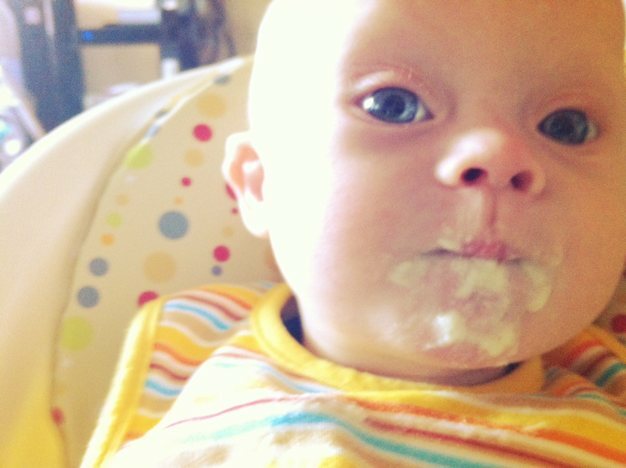 Since he is still developing his core strength he was a tendency to slide down while eating. This isn’t a huge problem, and really the only thing I wish the chair had. We are still fine tuning the seat for the the optimum eating postion, but for now Noah sure feels like a big boy in his new chair! In fact he was so relaxed in his new chair, he was able to have a nice dinner conversation with his mom during dinner! So what about you? What has your experience been? What have you used? What types of chairs? Any specific products? I’d enjoy hearing about your experience! I don’t have anything to add, but I am glad you posted this because we are in the same boat. Sam is only a couple of weeks older than Noah and needs an upgrade too! We hold him for bottles, but trying to hold him and spoon feed him is for the birds! Interested to see what others might have used for a high chair. Yay for chair upgrades for Noah! He is doing so great. We use the Fisher price space saver chair with Julian (who is 13 months). And it DOES have a shoulder strap. Just fyi! It’s been great. But the chair cover is a pain to take off when the shoulder straps. So we’ve actually taken out the shoulder straps – go figure. I like that the chair has shoulder straps. I”m surprised you took them out….our little guy slides down, witch is why I wanted to shoulder straps. Oh and when he was younger and less steady we fed him in the Bumbo.. You can see a photo here at my blog of my cutie patutie. This was when he was 6 months old. 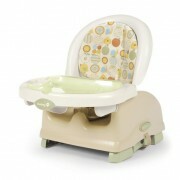 There is also a bumbo tray that connects with the Bumbo. It really keeps them steady in there. But it probably would depend on your child’s size and tone and such I’d imagine. Nice stuff! We have the tray for the bubmo chair…big fans! Not sure what exactly you mean by sliding (front to back or side to side?) Have you considered adding some rug gripper or dycem to the seat to prevent him from sliding forward at the hips? High chair seats are slippery which may make it more difficult for him. Thank you for posting this! I know I am 3 years behind, but I am eating up your blog posts, because we are at the point now where we need to think about what kind of feeding chair to get for our Evie, who is 4 months old and has feeding difficulties too. Thanks for sharing your journey. I’m glad you found things that work for you. I agree that having an adjustable high chair is really important.